Got a ten spot? Then you can afford to buy a share of these highly rated companies. A stock's share price doesn't tell you anything about its actual value. A $50 stock can be a better value than a $15 one, but that doesn't mean investors can't find deals in the lower-priced segments of the market -- if they know where to look. With that in mind, I recently ran a screen for stocks priced under $10 that have also earned a 5-star rating on Motley Fool CAPS. CAPS aggregates the bull and bear predictions of thousands of players, weighted based on the players' levels of success, to produce a collective judgment on the odds of a stock outperforming the market from here. Three companies stood out from the rest: Xerox (NYSE:XRX), Marvell Technology (NASDAQ:MRVL), and Platform Specialty Products (NYSE:ESI). Prices are as of Thursday's close. Marvell calls itself a "next generation" semiconductor company. It ships over 1 billion chips a year across its key markets of data storage, mobile and wireless, and networking. The stock has plunged lately, falling 22% this year amid a major slowdown in the industry that's crimping results. Marvell's sales fell 16% last quarter and profitability sank to 9% of sales from 15% a year ago. Management blamed weak demand "across all product areas due to near-term macroeconomic conditions," for the shortfall. CAPS players apparently agree that Marvell's problems are cyclical and don't threaten the long-term investing thesis. In total, 1,388 CAPS players have rated the stock, with 1,311 giving it a thumbs-up to outperform. And that makes sense. After all, the company remains profitable, having produced $350 million of net income over the past 12 months. Cash flow productivity, while down to a third of its level from two years ago, is still a solid 6% of revenue. That financial strength has enabled cash returns to shareholders to keep climbing through this rough spell, and Marvell's dividend seems well-protected at just 35% of earnings. XRX Cash from Operations (TTM) data by YCharts. Investors buying Xerox now are betting that an impending split will produce much better returns. 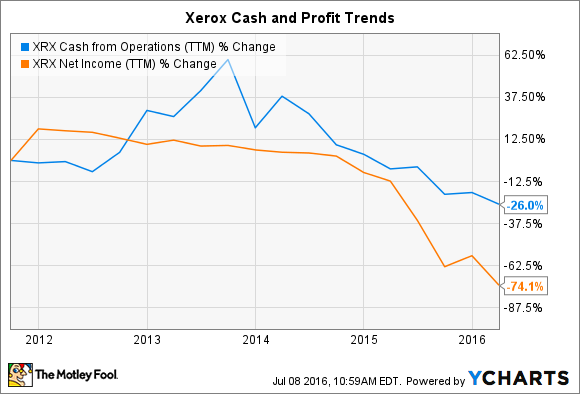 Before the end of the year, Xerox will separate its document business, with $11 billion of annual revenue and double-digit profit margins, from its struggling $7 billion business services segment. Executives believe that apart the two companies can save $2.4 billion over the next three fiscal years while each division gains more flexibility to attack its market opportunity, and $700 million of those savings are projected to accrue by the end of 2016. Investors will want to keep a close eye on debt going forward, though. Xerox carries over $7 billion of debt on its books right now, giving it a hefty debt-to-equity ratio of 7. Chemicals company Platform Specialty Products counts 40 outperform calls by CAPS players -- and just one underperform call. These bulls haven't been spooked by challenges in the company's key agriculture and Asian electronics markets that pushed organic sales down by 1% last quarter. Meanwhile, net loss ballooned to $135 million from $26 million a year ago. Yet most of that decline can be tied to foreign exchange swings. Platform's gross profitability actually improved in Q1, rising to 43% of sales from 39%. There's no question that the company is seeing weakness in many of its biggest markets. However, the company's diverse customer and geographic base, along with its focus on niche segments of the industry, has allowed it to perform better than rivals lately. At the same time, its acquisition strategy could benefit from the recent downturn by providing solid bolt-on business opportunities. Overall, these trends could set up a nice long-term buy for investors willing to ride out the current slump.